On Saturday, Pope Francis go do wetin no pope before am don do - e go visit schools inside Morocco wia Muslim imams dey do training. Dis na part of di pope official visit to Morocco wia im go follow meet wit King Mohammed VI wey invite di spiritual leader of 1.3 billion Catholics to epp am promote padi-padi wit Muslims and Christians. Pope Francis go lead mass on Sunday 31 March for di minority Catholic community wey dey di kontri. Francis go also visit school wia around 1,300 student dey study to become imams. 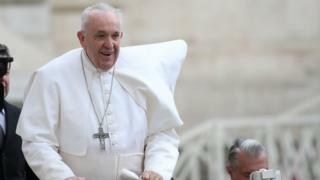 "Dis na very important event, di first time wey pope go dey welcome to school wia dey train pipo to be imams," tok Vatican spokesman Alessandro Gisotti. Di capital of Morocco don increase security ahead of Pope Francis arrival. Dem don repaint buildings, decorate streets and and make sure say di road wey im go follow dey kampe. King Mohammed VI na di "commander of di faithful" for Morocco, wia 99 percent of di population be Muslim, although dia own Islam religion no strong like oda Arab kontris own. In fact Morocco na di only Arab kontri wey for inside dia law, dem officially recognise Jewish pipo dem, and dem even get separate law and court to deal with dia mata for Morocco. Di last Catholic Pope wey visit Morocco na John Paul II for 1985.